5 Reasons why should parents send their children for music lessons. Do you know that learning music can enhance your children’s learning in their daily lives? Music has been a part of their life since the day they were born. When they were infants, parents or their nannies would sing familiar lullabies such as Twinkle Twinkle Little Star, Rock-a-Bye-Baby, Somewhere Over the Rainbow and much more that would put them into their sweet dreams. The interaction they have with music begins through listening. Parents in Singapore are very concern over the well-being of their children and are often worried if they would fair well in their studies but have we really thought of what is really good for them? The one thing that most parents are not aware of is the activities they should take part in such as music lessons, painting, dancing that would benefit their children’s learning in school. Here are 5 good reasons why you should let your children adopt a musical instrument while they are still young. Executive function, in other words, neurocognitive skill can be developed through music training. It not only allows the memory to work properly but also a flexible cognition and the ability to control them. A working memory includes being able to keep focus, retain or memorize information. It is an important skill for children to develop while they are still young and thus, learning a musical instrument helps them academically. Sometimes, when children perform badly in school and they are expected to attend tuition or remedial classes may not help them achieve a better result. Research has shown that learning musical instruments by taking up lessons and undergo training would aid in developing and maintaining these skills. Therefore, music and a child’s academic achievement should be tied together. Through musical training, your child would probably be taking part in orchestra practice and rehearsals to put up a concert or performance and the process would help to improve their social skills needed for the future. When we talk about social skills, it involves communication and interaction with their family members and their peers. With social skills, their sense of belonging to a group is stronger and thus lesser insecurity. 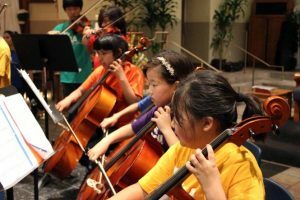 Social skills can be picked up either from group music lessons or in an orchestra which they have a strong contact and interaction with their friends. 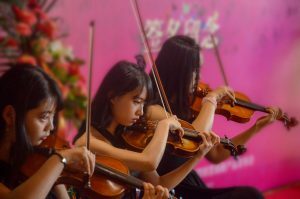 In an orchestra, they have to learn how to compliment each other to create a better music in which they have to see their peers as an ally and not a competitor. No doubt in the modern society, most people are very competitive at work but children should now learn to work with people that would compliment each other’s strength to create better value and healthy work environment. A better communicating and interactive skills would prevent them from potential unresolvable conflicts and foster better relations with the people around them. A collectivized society like Singapore would require the future generations to grow up knowing the importance of teamwork. Based on research, it has been discovered that learning music through training lessons would develop a better word decoding skill during their childhood. Word decoding is associated to how a child pronounces a word and how it sounded like. This is also known as a near transfer theory that is directly linked to the development of auditory abilities. There is a correlation between word decoding and phonological awareness as well as phonemes that are important elements in the early stage of reading. Near transfer works best during the initial stage of reading or children are not able to read well. For example, children who have dyslexia will have difficulty reading and pronouncing fluently. Therefore, children who undergo music training would be able to improve this skill because pitch and rhythm are very closely related to reading ability. Furthermore, research has shown that reading musical notation is the same process as picking up new words such as reading patterns that begin from left to right, visual patterns, and understanding visual symbol map to specific sounds. 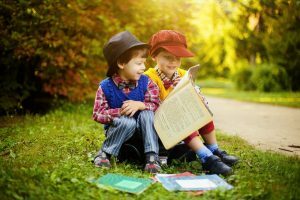 The question here is, would constant practice and reading be an efficient way for children to learn or is there a better approach to developing reading skills through music training? Singapore, being one of the many countries with the most advanced modern technologies can bring certain harm to the children. Apart from their school work and some outdoor activities, during their free time, what would your children be doing? Parents would allow their children to focus their attention on electronic devices for a few hours, sometimes unnoticeably lead to long hours where the eyes have not rested. Sometimes walking along the streets, you may realize children at the age of 4 years old sitting on the pram using the electronic gadget while their parents are able to do their own shopping. This is one reason why many children are getting myopia and shortsighted at a very young age. 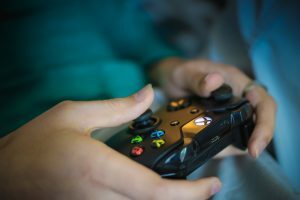 As much as health is a concern, certain contents on the web or social media are not restricted by age which could lead to children watching them without their parents being aware of it. Although it is important to expose children to certain experience, there should be a limit to the extent. Music is not a typical subject that can be learned in school. It requires time and interest because it may be a subject in school but would not be a focused subject like English and Mathematics. However, music plays an important role in both subjects. Research has shown that through learning musical instruments and undergoing musical training, children perform better in their English language as well as mathematics. The left part of the brain where language is processed can be developed through the help of music training. We are all well aware that English is an official main language in Singapore and everyone have to adopt this language as part of their lives. Do you know that Albert Einstein, a renown mathematician is also a musician? Thus, to boost children to a higher level of learning both English language and mathematics, music training could be the medium to their development. Music has explained the easier learning in children and that is to develop their brains better through exposure to musical training. For more information, please visit our website at www.themusicmood.com.